May 1993, around 2 pm. Mexican highpoint #1. 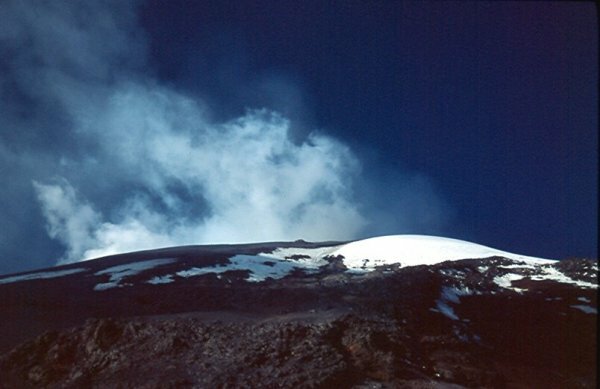 During our May 1993 trip to Mexico, Tom Buckley and I attempted to climb the volcano Popocatépetl, by the standard Las Cruces route. Neither of us had much mountaineering experience, and we certainly learned some lessons on this outing! On our way through Amecameca, we had some fabulous enchiladas de mole for lunch, and then took a taxi to the lodge at Tlamacas, at around 13000 feet. We spent the rest of that day, and all of the next, near the lodge to acclimatize (somewhat) to the altitude. We set out the next morning in the dark, around 5 am. Not knowing any better, my base layer of clothes was all cotton, jeans, t-shirt and flannel shirt. As we started walking in the morning, I warmed up pretty quickly, and wondered if I would really need the extra layers I had in my pack! (Answer: Oh, yes.) At the beginning, the weather was clear, but as we passed the (ruined) Las Cruces hut at around 15000 feet, it turned cloudy. Lesson Number 1 was learned at this point, as it quickly got much colder. I had enough extra layers, including a windproof jacket and pants, to keep myself warm, but Tom was not as thoroughly equipped. Unable to keep warm, he had to turn around. There were some other climbers just ahead of us, and since I was not so cold, and still felt ok from the altitude, I continued on. 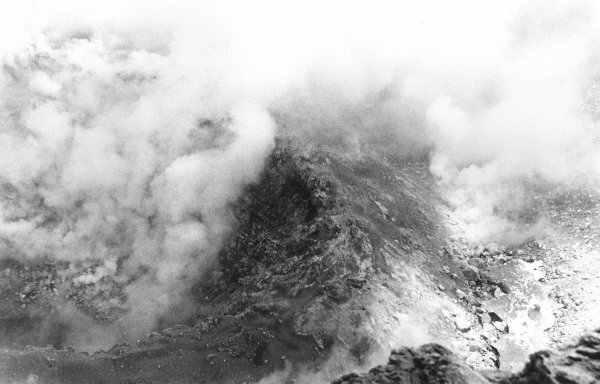 The next section was a slog up loose volcanic ash to the crater rim at around 17000 feet. Normally, this section is snow covered, but this day there was no snow on this part. When snow covered, and cloudy (as it was this day), it would have been easy to miss the end of the slope as you reach the crater rim, especially in an altitude-fogged mental state. There were some crosses at the crater rim, presumably in memorial to some who failed to notice, and fell 300 feet into the crater. Without snow on the ground, it was easy not to make that mistake. At this point, the route turned right and followed the crater rim uphill to the summit. About a third of the way along the rim, the route became snow covered, at the edge of the glacier. Most of the way here was a cycle of taking a few steps, stopping to gasp for breath, and repeating. 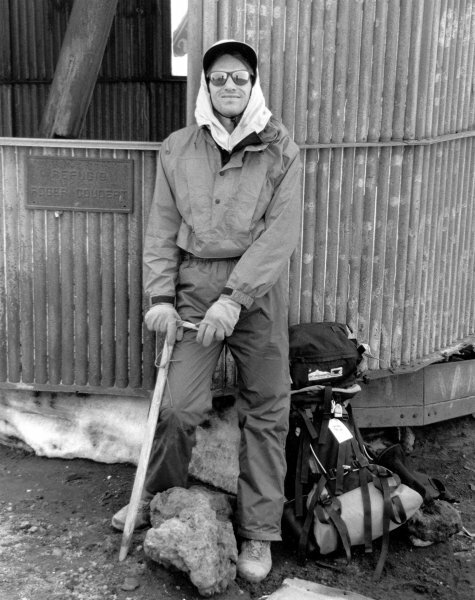 I was quite tired by the time I reached the hut at the summit! Clouds still mostly obscured the view, and I did not stay very long on top. The descent, after traversing the rim and starting down, was quite a lot of fun! Instead of the tedious slog up loose ash, as on the ascent, I had some wonderful plunge-stepping down the volcanic ash. (Gaiters would have been helpful, my boots got filled with ash, but I hardly cared.) The descent went very quickly that way, and it was not long until I returned (albeit exhausted) to Tlamacas. 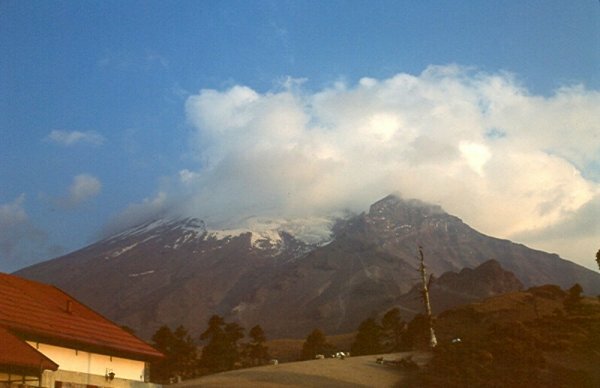 This volcano is the highpoint of the state (not the nation) of Mexico. The altitude seems a little disputed, I have seen different numbers, but 5452 m seems to be the most common. 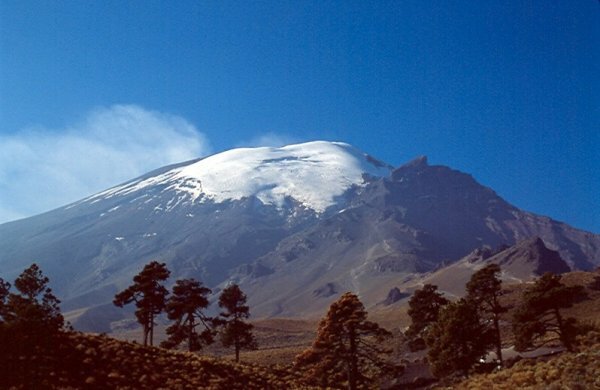 According to the legend of the volcanoes, Popocatépetl is the present-day form of a warrior, Popoca, who hoped to marry the beautiful princess Mixtli. When a tragic mistake led Mixtli to kill herself, thinking that Popoca had been killed in battle, Popoca carried her body into the mountains, hoping the cold snow would wake her, and they would be reunited alive. Mixtli's body was transformed into the nearby volcano Ixtaccihuatl, whose shape resembles that of a sleeping woman. Ever since, Popoca, as Popocatépetl, has watched over his beloved. 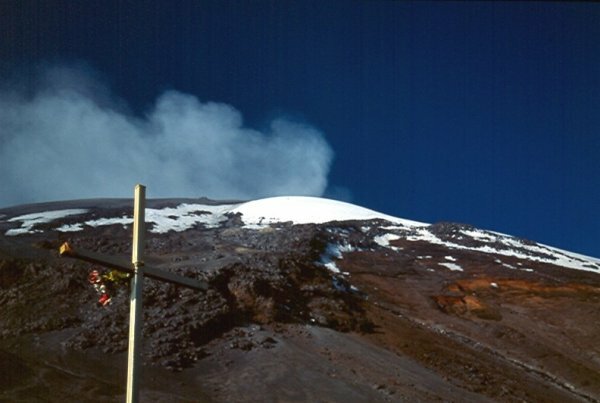 Popocatépetl, with Tlamacas at the left. 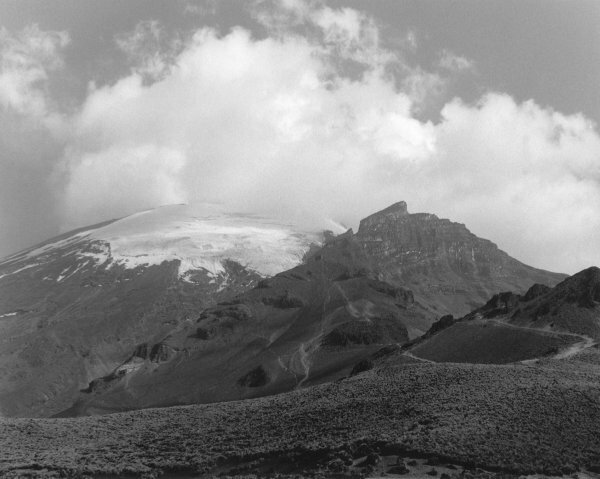 View of Popocatépetl from near Tlamacas. View towards the summit from near the ruins of the Las Cruces hut. The clouds are actually volcanic fumes coming from the crater, not water vapor. 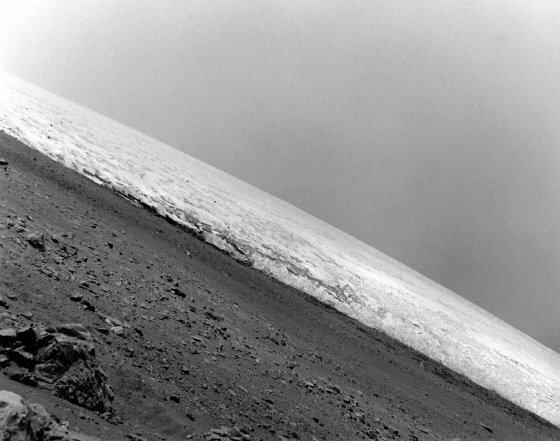 This view of the glacier reminds me of Mars. Fumes out gassing from the crater floor. The foul smell of H2S was very apparent at the crater rim. Mexico's Volcanoes. A Climbing Guide. By R.J. Secor. The Mountaineers. 1981.